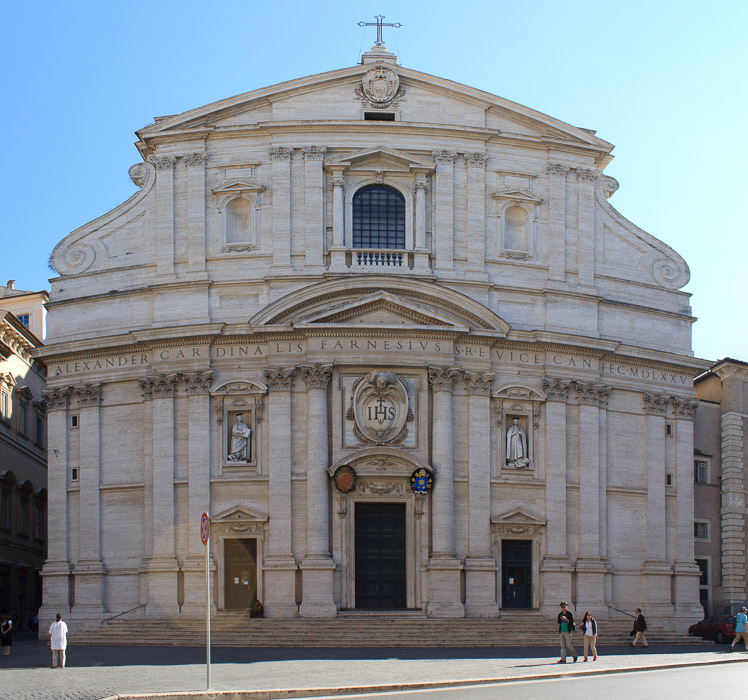 The Gesu Church is the mother church of the Jesuits. It's plain-looking facade (1st photo below) was unique in its time even if it looks pretty plain today, but the inside of the church is anything but plain. It was built from 1568 to 1584. 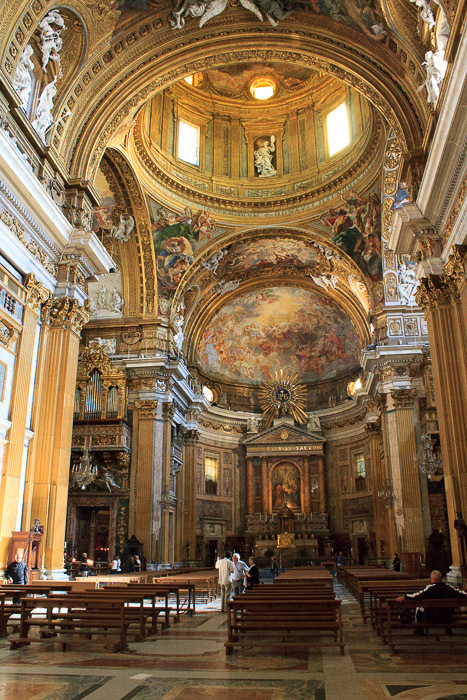 When you enter the church you'll see the ornate nave shown in the 2nd photo below. 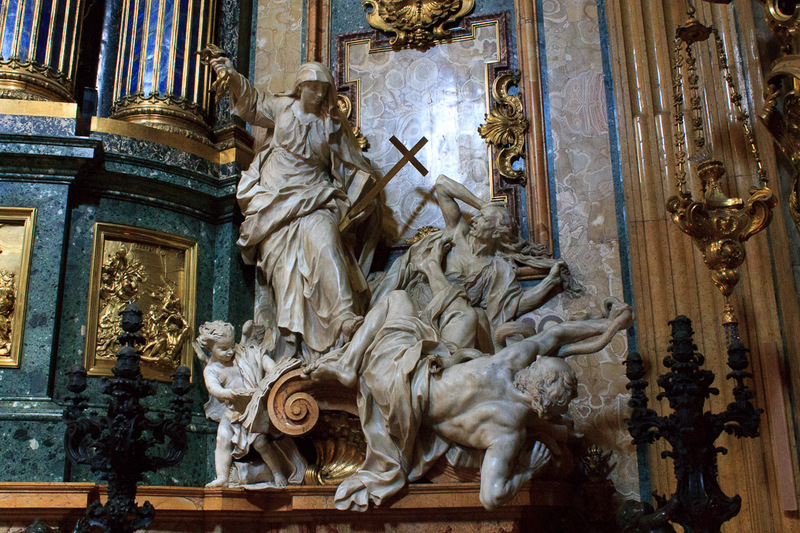 When the church was first built the walls were white, but since the 1600s they've been decorated with the over-the-top Baroque artwork that we see today. The layout of the church is very simple; it's just a single nave without side aisles, so the congregation's attention is focused on the altar. Instead of the side aisles, there are a series of interconnecting chapels behind the archways between the columns. 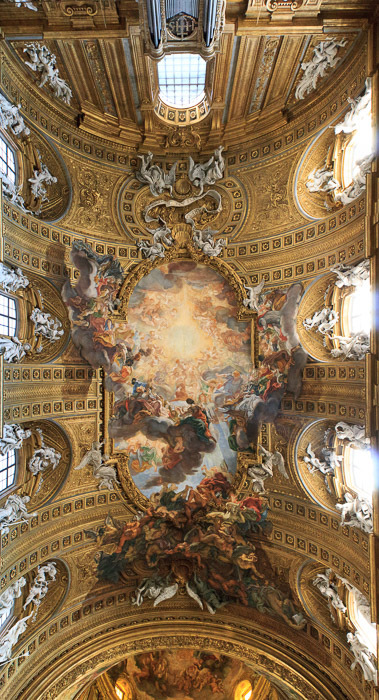 See all Gesu Church photos. 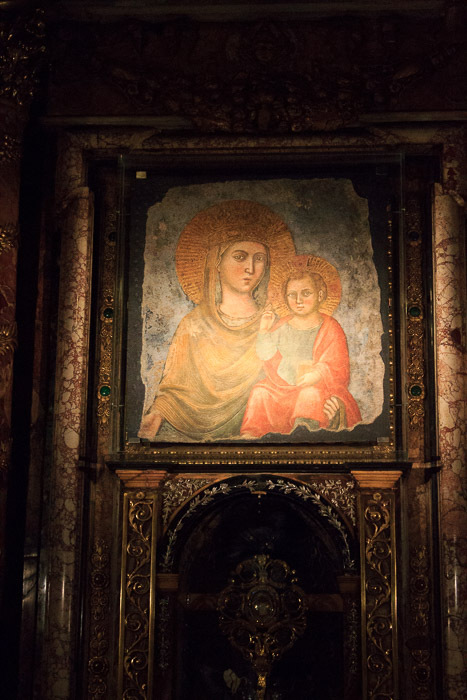 Before you get too far into the church, look up at the gorgeous frescos and statuary in the ceiling (shown in the two photos below). You can either look up at it or look down into a mirror on the floor if you don't want a sore neck. 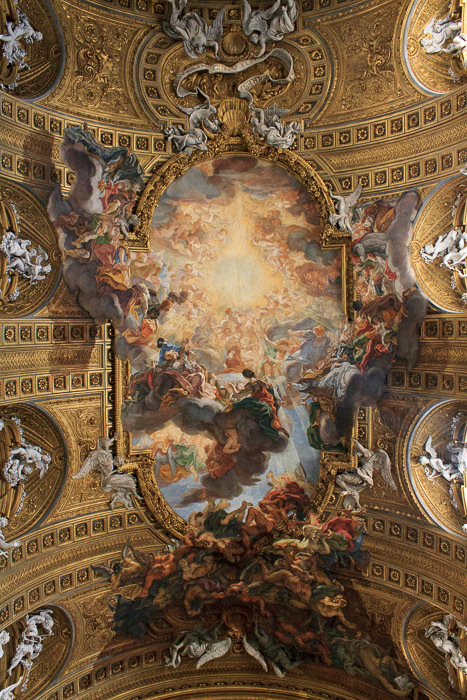 The work is called "Triumph of the Name of Jesus", and it was created by Giovanni Battista Gaulli, a student of Bernini. A glowing cross with the initials "I.H.S" (Jesus Savior of Mankind) pleases the faithful and sends the damned plunging downward over the edge of the painting's frame on their way to hell. The blinding light coming from the cross seems to break through the ceiling. 3-D stucco figures mingle with the figures painted into the fresco to bring more life into the painting and amplifying the illusion. 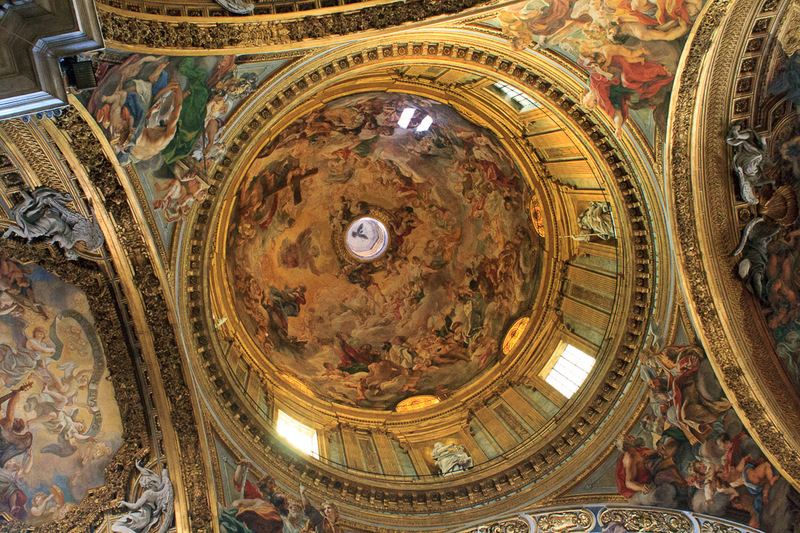 Just past the fresco is the dome of the church, shown in the 1st photo below. Again spectacular artwork prevails. At the front of the church is the main altar, shown in the 2nd photo below. 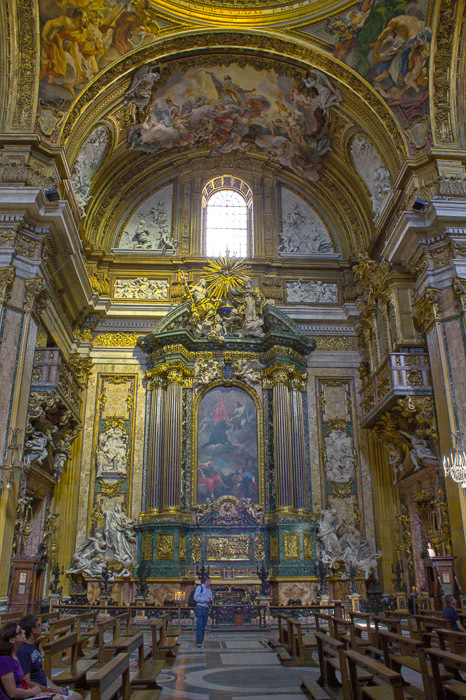 The founder of the Jesuit order, St. Ignatius of Loyola (1491-1556) is buried in the small coffin near ground level in the altar in the St. Ignatius Chapel, on the left side of the main altar. On either side of the altar at ground level are the two beautiful sculptures shown in the 3rd and 4th photos below. 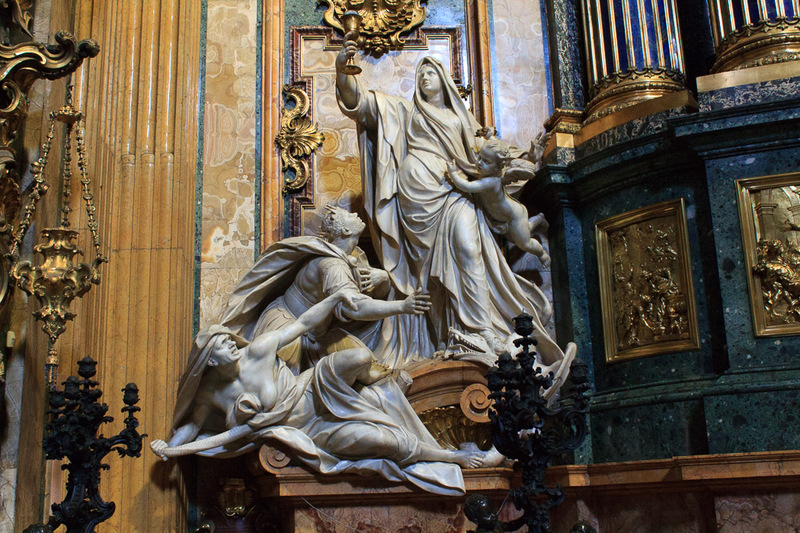 The 3rd photo shows "Faith that Wins Idolatry", by Jean-Baptiste Theodon (1645-1713), and the 4th photo shows "Religion Overthrowing Heresy and Hatred", by Pierre Le Gros the Younger (1666-1719), which has a putto on the left side frantically tearing pages from heretic books by Luther, Calvin and Zwingli. 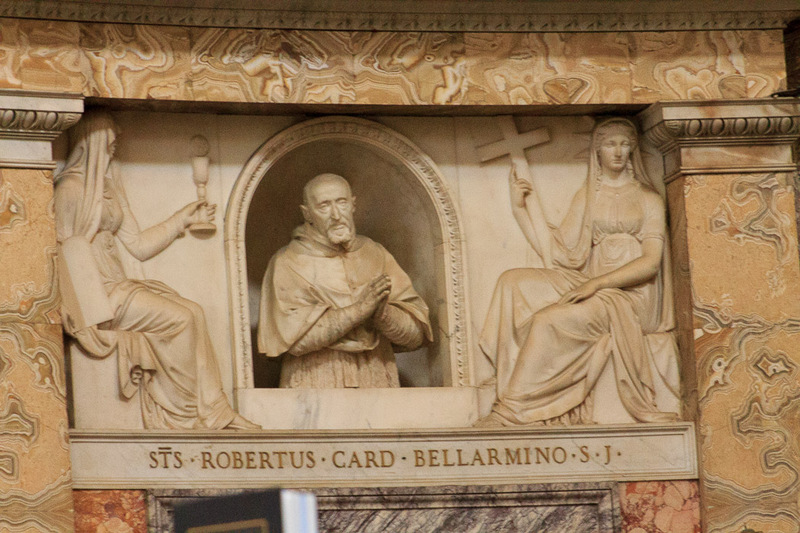 The church houses Bernini's Tomb of Cardinal Roberto Bellarmino (1st photo below), as well as a 13th or 14th century fresco of the Madonna and Child, in the Chapel of Our Lady of the Road (2nd photo below).